More details about this aircraft can be found in the publication USN Aircraft 1922-1962 Volume 2 for the paperback version, but the e-books are available in this site. 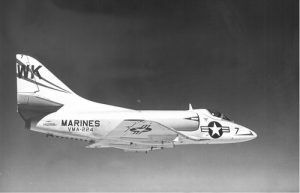 Photo Skyhawk A-4A – 01: The USMC was quick to introduce the Slyhawk into its inventory. VMA-224 was one of the first to do so in late 1956. This Skyhawk, 142168 was issued in March 1957 and later passed on to VMA-211. 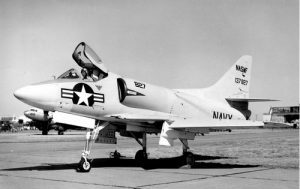 Photo Skyhawk A-4A – 02: Skyhawk YA4D-1 137827 of the first bacth built and maily used as test aircraft. This Skyhawk is seen here while assigned to the NASWF. 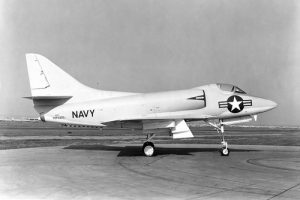 Photo Skyhawk A-4A – 03: Skyhawk YA4D-1 137827 of the first bacth built and maily used as test aircraft. This Skyhawk is seen here while assigned to the NASWF. Photo Skyhawk A-4A – 04: Skyhawk A4D-1 142168, seen here flying while serving with VMA-211. It was previously used by VM-224 (see photo 01). 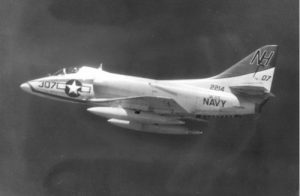 PhotoSkyhawk A-4A – 05: Skyhawk A4D-1 142218 of VA-113 assigned to the Pacific Fleet. 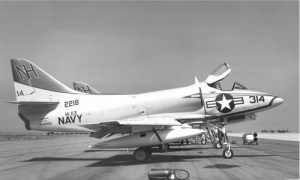 This Skyhawk became an A-4A in September 1962 and was lost in an accident in October 1967. Photo Skyhawk A-4A – 06: Skyhawk A4D-1 142144 of VA-125. This squadron used the A4D-1 a few months only in 1958 before swithching to the dash 2. 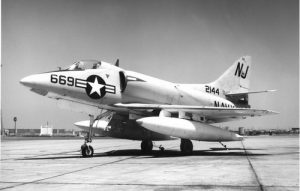 Photo Skyhawk A-4A – 07: VA-112 based at NAS Miramar, operated the A4D-1 Skyhawk a couple of months in 1959-1960 including 139947. It was later issued to VA-126 also based at NAS Miramar. 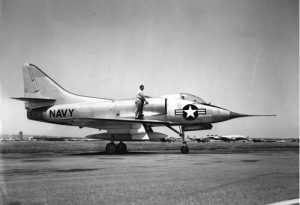 Photo Skyhawk A-4A – 08: Skyhawk A4D-1 142176 of VA-83 before to be passed on to VA-44 with which it will be lost in an accident in February 1959. 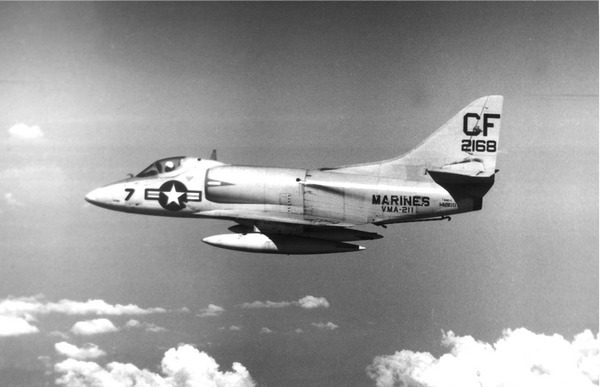 Photo Skyhawk A-4A – 09: Skyhawk A4D-1 142214 of VA-113 seen in flight before being lost in an accident in November 1957. Accepted by the Navy in May 1957, It had flown 170 hours only. Photo Skyhawk A-4A – 10: Skyhawk A4D-1 142145 of VA-43. This squadron was part of the Replacement Air Group Atlantic (RAG Atlantic) which was providing the final pilot training prior to Atlantic Fleet assigment. 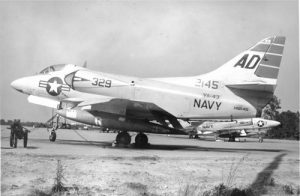 Photo Skyhawk A-4A – 11: Another A4D-1 of VA-113, 142229, one of the last accepted by the USN during the summer 1957. It is one of the 84 surviving A4D-1s to receive the denomination A-4A in September 1962. 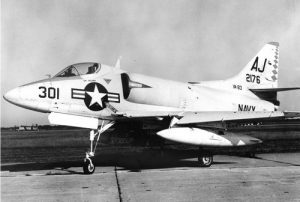 Photo Skyhawk A-4A – 12: The prototype XA4D-1 seen on the ground. 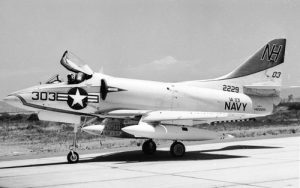 Photo Skyhawk A-4A – 13: Skyhawk A4D-1 137829 seen before the acceptance by the Navy. It was used as a test aircraft and was withdrawn from use in April 1963. 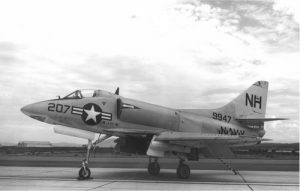 Photo Skyhawk A-4A – 14: The prototype XA4D-1 on the ground at El Segundo. 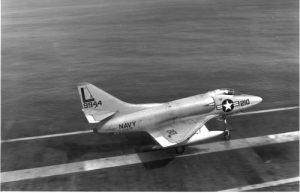 Photo Skyhawk A-4A – 15: Skyhawk A4D-1 142169 from VA-113 ready to be launched from USS Hancock in the late fifties. 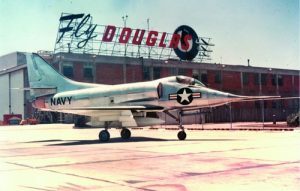 Photo Skyhawk A-4A – 16: The first Skyhawk rolling out from Douglas facilities. 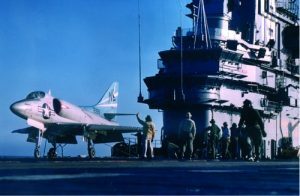 Photo Skyhawk A-4A – 17: Shyhawk A4D-1 139966 of VA-43 on the deck of USS Antietam. 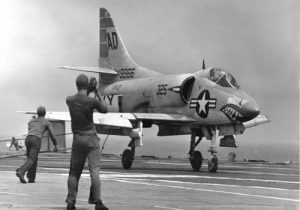 This Skyhawk was redominated A-4A in 1962 but was lost soon after in February 1963. 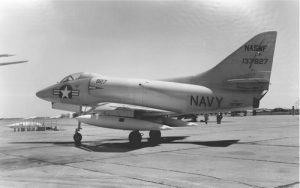 Photo Skyhawk A-4A – 18: Skyhawk A4D-1 139944 while conducting carrier suitability testing with VA-72. 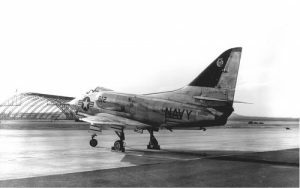 This Skyhawk was lost in an accident in December 59 with VA-44. 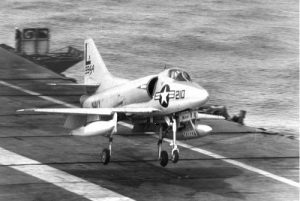 Photo Skyhawk A-4A – 19: The same Skyhawk (photo 18), a few seconds before the deck landing. This entry was posted on July 31, 2014 by Phil Listemann.